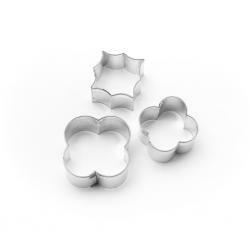 With this "L", "T", "Y" & "Z" set of 4 double sided cutters you can create a multitude of design patterns! The possibilities are endless. Custom design by Lisa Bugeja of Flour Confections. Each cutter is approximately 1 1/4".